No doubt Megan Fox is passionate about her tattoos, but what exactly has she had inked on her skin and what do they each mean to her. 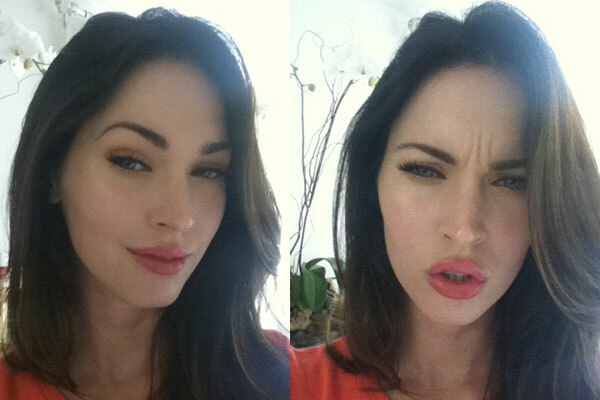 During an interview Megan expressed that her tattoos are a way to say F.U. to Hollywood, here’s what she had to say. Megan’s next tattoo is a star and moon symbol on her left inner ankle. “I have one on my ankle – an upside-down star and a moon because my dad used to read me a book when I was little that had a moon and star on the back.” This is Megan’s only tattoo with colored ink to date. 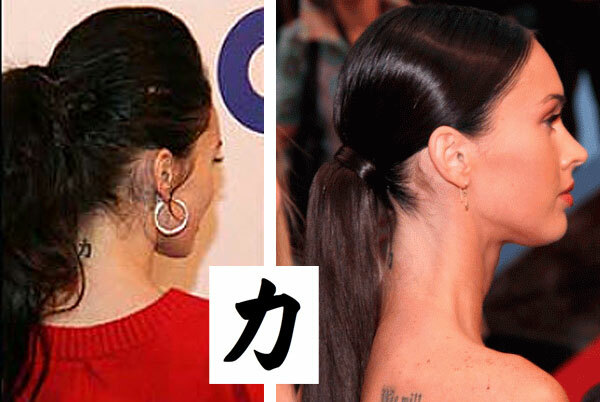 The tattoo on Megan Fox’s left wrist is not one of her favorites, a ying yang tribal tattoo of two waves. She has said that she regrets getting it because, “The guy was smoking weed while he tattooed me and he didn’t do it correctly. Now it’s nothing and I’m gonna get it removed. I was told he was a really amazing tattoo artist but he wasn’t on his game that night. He was distracted.” The Transformers actress has hinted that she may have it removed in the future, although she has yet to start the process. Megan also has a tattoo of her husband, Brian Austin Green’s name tattooed just south of her waist by what she refers to as her “pie”. She got the tattoo in 2005 of her then fiance, and when asked what she would do if they ever broke up responded that she would keep it, because she could always name one of her children Brian! 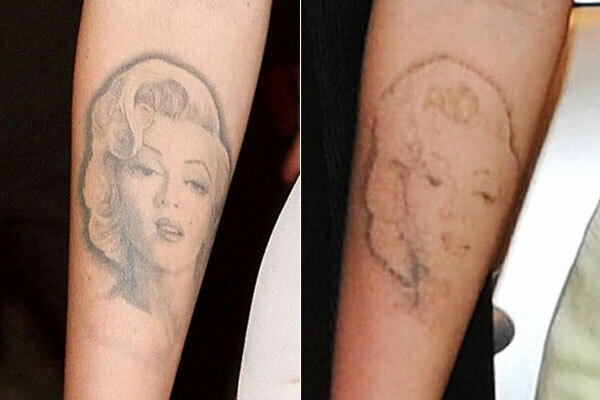 Megan’s next tattoo is that of her idol Marilyn Monroe inked on her left forearm. She has said that the actress was the first person she was ever exposed to on the television and when she would come on the young girl would cry upon hearing her voice. It was inked by famed LA artist Mark Mahoney, who has done Fred Durst and Angelina Jolie. When Megan was asked what it meant, she replied “to not get too caught up in Hollywood because people will end up laughing at you.” Which in our opinion is very ironic considering the actresses latest plastic surgery tweaks! The next textually prominent tattoo Megan got was a poem she wrote and tattooed it along her left ribcage. The poem reads: there once was a little girl who never knew love until a boy broke her HEART. This tattoo is also done in Old English and is a tribute to a friend who died in a car crash. She has said that the tattoo itself was very painful, but liked the whole process, and even compared it to pulling a tooth. 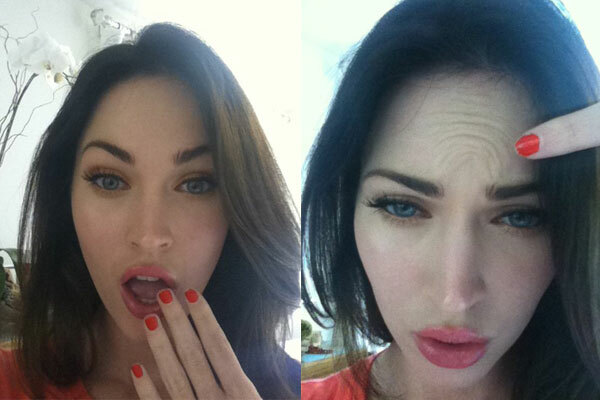 Megan Fox definitely cares what the public thinks of her regardless of her “F.U.” attitude. If she didn’t why would she be getting so many look altering plastic surgery procedures? Is this all part of a “I wanna be the next Angelina Jolie” plot? What do you think of all her ink, is it genuine, does it suit her, or is it superficial?